View More In Laptop Accessories - Page 2. 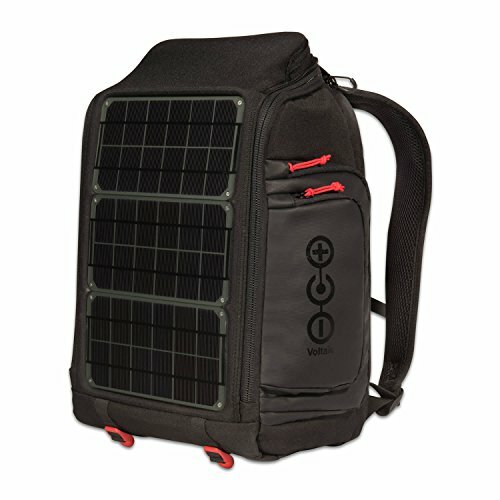 The Array 10W solar backpack is Voltaic's powerful solar solution for charging laptops, DSLR batteries, tablets and smartphones. It includes a removable 19,800mAh/73Wh rechargeable battery with 5V/2A USB, and 12V/4A, 16V/3.5A, 19V/3A selectable outputs. Voltaic's products have been used on all seven continents by photographers, researchers, and outdoor enthusiasts to keep their gear running in extreme conditions! Available in three colors: orange, silver, and charcoal. Each charger is engineered and individually tested in the USA by Voltaic Systems and covered by a two year solar bag and one year battery warranty. Laptops: 1x charge for nearly all 15" and smaller laptops. Please visit our website for known issues with certain models. 12 hours in the sun to charge most laptops. 10" Tablets: 1.7x tablet charge from included V72 battery, 3.5 hours in the sun charges most tablets, 2.5 hours of tablet use from 1 hour in the sun. Tablets: Charges all known tablets, including full size Apple iPads and Samsung tablets. Smartphones: Charges all USB devices including all Apple, Android, and HTC smartphones. Digital Cameras: Can charge 12V DSLR batteries via cradle and cameras that charge from USB. Features: Key clip, dedicated smart pocket for cell phone, 25L of storage. Solar Panels: 10W at 6V or 18V (selectable), waterproof and UV resistant panels with self-healing urethane coating to prevent scratches. V72 Battery: 19,800mAh/73Wh, Output: 5V/2A USB, and 12V/4A, 16V/3.5A, 19V/3A selectable, Input: 14-20V, Battery Type: Li-Polymer, Protection: Short circuit, over charge, over discharge, over current, over temperature. Included Accessories:10 standard laptop adapters, laptop output cable, car charger socket, both AC (wall) and DC (car) chargers. PANELS - 3 rugged monocrystalline solar panels with 10W total peak output at 6V or 18V (selectable depending on application). The panels are waterproof, lightweight, and coated in self-healing urethane to withstand abuse and resist scratches. BATTERY - The system includes the removable and portable V72 battery pack; a 20,000mAh/72Wh battery backup bank with 5V/2A USB, and 12V/4A, 16V/3.5A, 19V/3A selectable outputs that can also be charged from the included AC (wall) or DC (car) charger. CHARGING - 1 hour in the sun will power an efficient laptop for up to 40 minutes and provide 2.5 hours of 10" tablet use from 1 hour in the sun. COMPATIBILITY - Designed to power and charge laptops, professional cameras, and thousands of devices that charge from USB, including various handheld devices and smartphones, and DSLR camera batteries from manufacturers like Apple, Samsung, Sony, Asus, Acer, HP, Nikon, Canon, Lenovo and many more. DESIGN - Backpack is made of lightweight, water, and UV resistant fabric manufactured from recycled PET (soda bottles) and has 25L of storage, a padded laptop and tablet sleeve, and plenty of other pockets.